What are copywriters looking for? I like (almost) all my competitors and I compare notes with them. Based on conversations with my colleagues, we all want pretty much the same things. • Good opportunity for good/great income. • Quality traffic and lots of it. • The ability to test. • Patience from the client. • A professional environment. • Prompt payment. • A “white hat” approach. • Respect. No great revelations there so let me give you some reasons I have fired clients. • I have a thick skin but I won’t work with a company that berates me. This happened recently. • Lack of trust. • Poor communication. • Too many people critiquing the copy – especially when members of the inquisition are not copywriters. 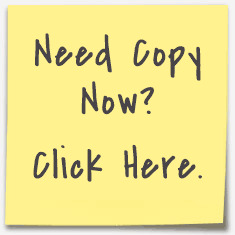 • Letting copy get “stale” … especially in the financial area. I’m also leery when a company brings in a “copy chief” to critique my work. One of my clients recently did this. The “expert” bashed me personally and bashed the VSL I wrote, essentially saying the VSL had no chance to do anything. The client ran the VSL anyway and it produced over $20,000 in revenue from a small segment of the client’s house list. A $19 sale. Not too shabby – especially as it was a prevention theme. Copywriters are almost always going to bash the work of other copywriters. You all saw an example in a forum when I showed the blood pressure supplement copy to the group. I knew the other copywriters might bash the work but I was genuinely interested to see why so many potential customers were getting to the order page right at the end of the funnel then not buying. I wrote nine versions of that copy across the entire funnel. The click through numbers were excellent but something wasn’t working. And I was looking for some insight from this group – at the risk of getting hammered by some copywriters. The guy I was working with thought the traffic demographic was wrong plus there were some funky things going on in that company: with a lot of chiefs plus the involvement of the owner’s daughter, an MBA and expert copywriter. But something wasn’t working and it proves that testing is the only correct critic. There’s only one copy chief that matters: the customer. I saw some copy for two conferences. The copy for the first one was OK at best – I thought – but the event was full. The copy for second was short – too short – and didn’t give me enough information to get the live feed. But the event was packed. I only judge direct response copy on the results. In the last 24 months, I’ve noticed a shift in the copywriting world where several famous – or infamous – copywriters are no longer writing much copy. Instead, they’re forming coaching groups and charging a small fortune to mentor copywriters and speak at events. It’s because someone moved their cheese and I’m not sure they have the speed and/or desire to chase the new cheese. Finding great clients is hard. But finding needy copywriters is easy. In the case of one of the gurus, I’ve seen his work in one of the niches where I’ve helped a client build a multi-million dollar empire pretty much from nothing. The guru’s work in this niche comprises bold-faced lies and when I’ve asked him about results, he avoids the subject. I can see bringing in an accomplished copywriter to help a totally nascent copywriter get up to speed. Even then, constant bashing will only make them hate the trainer, copywriting, and the client. They will want to work behind a bar or at the lost luggage area in the airport instead. Patient testing is an awesome copywriting coach. Plus there are so many superb books, manuals, and resources available. Gary Bencivenga’s bullets are on the Internet – for FREE. Mike Palmer of Stansberry cites these as superb advice for direct response copywriters. Spend less than $1,000 on copywriting books for your copywriter and you’ve pretty much covered it. I provide a series of 100 “how to” copywriting videos for $9 a month … the price is low as I build this resource to critical mass. I’ve taken several paragraphs to stress an important point – be careful about how you train your copywriters and critique their work. I’ve had copy I thought was excellent fail miserably. I’ve had copy the copy police would scoff at produce epic results. So don’t bash … test. And give your copywriter the width to fail and learn. Let me give you a sense of how to treat a copywriter so the copywriter produces sales and revenue for you … and so you don’t have a “copywriter carousel” where you’re constantly hiring and firing copywriters – or having them fire you. • Expect the copywriter to meet deadlines but give the copywriter input on the deadline. • Make sure they understand the ‘state of awareness’ and ‘state of sophistication’ at an almost professorial level. • Be careful about bringing in an outside ‘copy basher in chief.’ • Great copy does not come from a committee – it comes from research plus linking the benefits of the product to the desires of the customer. • Understand that copywriters have different styles. Some copywriters like to hyperventilate. I’ve seen Gary Bencivenga copy that’s understated. • Test like crazy and get the copywriter to feed the testing beast. • Communicate, be professional, and treat the copywriter with respect. • Keep the copywriter in the loop when it comes to testing results. VITAL. • Provide the copywriter with as much information about your products and customers as possible – and spend several hours doing this. • Don’t expect the copywriter to write on spec/royalty right away. • Avoid crowdsourcing sites like elance. • Provide a clear creative brief. • Be realistic … don’t ask your copywriter to sell sunlamps in the Sahara. • Let the copywriter write and test across the entire funnel. Now let’s get to compensation. Let’s be brutally frank – and I know I’m biased … based on what I hear and my research for my database, there are lots of companies who understand the value of copy who are desperate for serious copywriters. You cannot learn to write direct response copy at any college I know of. Universities pump out lawyers (yay!) but they don’t pump out direct response copywriters. I’ve been to the AWAI boot camp three times now and yes – 400 copywriters show up – but in that 400 you’ll find 10 super-experienced writers who are booked and/or coaching and not writing copy. You’ll find about 50 writers like me who have helped clients sell stuff but want to get to the top of the trade. Then you’ll find about 340 people who have bought into the AWAI dream and are just trying to get started. Most will not return, sadly. They will never get their copywriting business off the ground and I feel really, really bad for these people. The forces of supply and demand are not in your favor when it comes to finding and keeping copywriters. Brutal but true. But you can get a great copywriter to join your team – essentially for FREE. Sorry but my keyboard can’t type that word FREE in small caps. You don’t have to pay a fortune in upfront fees for a copywriter and, to keep them happy financially, you can provide a portion of the increase in revenue. Get your model right and the services of a great copywriter simply help you make more money AND increase the value of your business. But my best advice when it comes to treating copywriters is to be like Marty Edelston, who found great copywriters and treated them like royalty. From my perspective – and I’m getting better at this – I look at how much time I spend on a project … and what I’m earning. And I’m kicking out the people who are wasting my time. Am I a great copywriter? An A-lister? What does that really mean, anyway? I just had a health project fail. Great click through numbers but no sales. But another health client became the fastest growing company in Charlotte, which has a crazy-good economy. My golf client has succeeded where a ton of people have failed and one promotion generated $1.6 million in sales of wedges from an obscure manufacturer. The copy on my site has generated over 500 leads in 4 years. There have been more failures than successes. I won an AWAI competition … $1,000 spent that night in The Blue Anchor in Delray Beach on other copywriters. Oh well. Clayton Makepeace said he liked my stuff. My clients typically keep me around – because the copy converts. If you want my attention, then put me on a retainer for a few months and let’s see how things go. If there’s some traction then let’s move forward with a fee plus a slice of the increase in revenue. I’m doing this with one of my biggest clients. One of the owners of the company used to work for Goldman Sachs and he understands the “eat what you kill” compensation model. I sort of like the NFL compensation model where most rookies get minimal pay but if they do well, they can get some guaranteed money plus certain bonuses. NFL players can also get cut at any time. Someone coming up to me and saying, “it’s a great opportunity if you’re willing to take a step backwards” is a bit of a turn off. Digging deep into the soul of the direct response copywriter, we all live in a state of semi-panic as it’s us vs. the world. The company that provides some succor is one that will get the attention of the freelancer. Finally – let me introduce a key concept in my little world. Both terms from my upbringing in the UK. My father is one of the top classical musicians on the planet. He also used to work in the session world – playing on pop records and movie soundtracks. The person who booked the musicians was/is known as the “fixer.” An IMPORTANT person with great work and plenty of money. In the UK, the word “punter” has at least five meanings. Someone who bets and usually loses. A customer. For example … “this bar is really getting the punters in the door.” Someone who visits a betting shop. Someone who visits a “business” woman. A general person – usually of low intelligence and dodgy demeanor. I separate potential clients based on the fixer vs. punter rule. When you’re approaching copywriters, be a FIXER and not a punter. Did Gary Bencivenga work for punters? I think we all know the answer. He told copywriters not to take on marketing challenges. I will never say that the success of a direct marketing business depends entirely on copy. Other factors come into play. But others who have been supremely successful will tell you that much of their increase in revenue comes from finding – and keeping – ambitious copywriters. Now you know a little about what makes copywriters tick … and I hope this helps you grow your business and become even more wildly successful. How NOT to Find Copywriting Clients. Part 9. NOTE: You're reading a series of essays about how to find copywriting clients ... and how NOT to find them. This series will be extremely controversial. Read the blogs and you’ll discover my experiences with finding direct response copywriting clients … what works and what’s a waste of time. The goal is to help you find “elite” level clients with deep pockets who are looking for top-quality creative talent. My focus is on direct response copywriting but it all applies to all creative talent. Early in my career, I attended a large number of “networking” events. These typically took place in Charlotte where I live. I’m usually an outgoing person and I usually like meeting new people in a social setting but I never really liked the networking events. First, as someone who spent his formative years in England, I have an English accent. This becomes the first point of conversation at a networking event and I got tired of providing my life story NINETY times in the space of 60 minutes. Second, I never really met a good client for my direct response copywriting services. There were lots of people selling life insurance. Plus lots of people selling real estate. Nothing against insurance and real estate but the people I met just weren’t good potential clients for this direct response copywriter. In some cases, I joined, or was added to, the committee that organized the networking groups. This was enjoyable because I met some fun and wonderful people but it was also a painful waste of time … especially when I had to listen to committee members drone on about nothing for several hours. Building and developing a network is extremely valuable. I think back to the days before the Internet when people had a Rolodex … or two. Just the Rolodex itself could be extremely valuable. From time to time, I attend so-called networking events where I can potentially meet clients and “network” with other direct response copywriters. Again – it’s a nice time but I can’t say it’s a great way to meet great clients. It takes years … decades even … to build a great professional network. And the network can be extremely valuable. Websites like LinkedIn can be useful and speed up the process but, ultimately, network building the traditional way takes a long time. Fortunately, there’s a way to build a really strong network quickly and with a much more targeted approach. You have to be proactive and go after the clients you want. To get the clients you want then you must create your own list of "ideal" clients ... then go after them. I have a hand-crafted list of 2,000 potential clients. To get access to this list, click here now. How NOT to Find Copywriting Clients. Part 8. You'll find plenty of copywriting "gigs" on sites ranging from Craigslist to daily emails. You'll even find quasi-classifieds on Facebook groups. Companies and individuals who need direct response copywriters post opportunities on websites and in emails. This reminds me of the days before the Internet when newspapers had all those pages of job vacancies. Yes ... there were plenty of opportunities BUT it was just a fraction of the opportunities that were truly available. Most importantly, if you really looked at the companies providing those opportunities, they weren't exactly the top companies. And I would always hear, "only 1/3 of all opportunities are advertised in the newspapers" and so on. There's an element of truth to the latter statement. The top companies are rarely advertising in the classifieds. And the top companies are the ones with the top opportunities and the biggest budgets. So it makes sense to be proactive and go after the clients you want. To get the clients you want then you must create your own list of "ideal" clients then go after them. I have a hand-crafted list of 2,000 potential clients. To get access to this list, click here now. Direct Response Copywriter on How NOT to Find Clients. Part 5. How NOT to Find Clients. Part 5. Method #5. Trolling Sites Like Warrior Forum. To be completely frank, I don't spend too much time cruising around sites like Warrior Forum. It's a site for Internet marketers. Sometimes, when I visit these sites, I come across a direct response copywriter who is looking for a gig. Sometimes there are marketers who are looking for copywriters. I'm sure there are people who love these sites. And some copywriters find gigs this way. But these sites are ultimately like the Wild Wild West: pretty much anything can happen plus you'll find plenty of "black hats" ... people who are not exactly playing by the rules. Yes -- there are plenty of marketers who are fine and perhaps I should spend more time trolling around. But my sense is there are plenty of clients with little or no money ... but massive reputations. There's a better way to find clients. If you want the top clients then you have to be aggressive and go after them.